Hot spark plugs operate at a hotter temperature which works well with the colder combustion produced by standard or performance engines. However, hot spark plugs cause pre-ignition (pinging) with the much hotter combustion produced by supercharged engines. Therefore, by using cold spark plugs with the much hotter combustion produced by Negative Pressure Supercharging and hot air induction it prevents the spark plugs from prematurely igniting the hotter intake charge. The colder combustion produced by a standard 360 Chrysler small block uses hot NGK BP5ES spark plugs to prevent the plugs from fouling and causing misfire. A performance 360 produces slightly hotter combustion which uses slightly colder NGK BP6ES spark plugs to prevent pre-ignition. 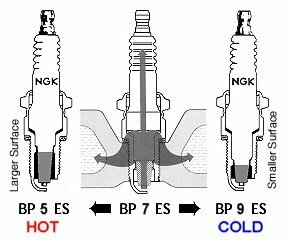 Whereas the much hotter combustion produced by a 360 with Negative Pressure Supercharging uses much colder NGK BP10ES spark plugs to prevent pre-ignition.